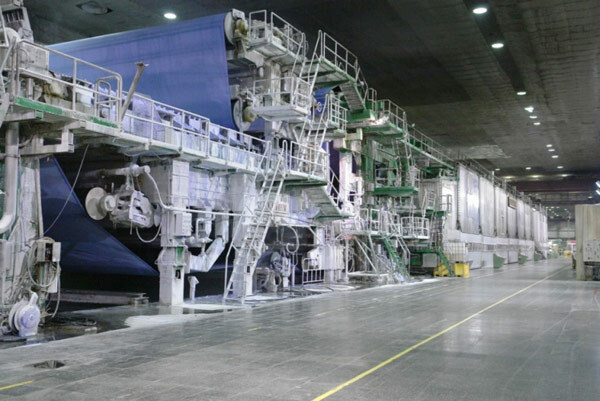 The paper machine consists of head-box, filter, pressing part, drying part, calendering, paper winder, etc. The main drive electric control system is a speed chain coordination system made of multi-transmission points. A fixed transmission rate is required between transmission points to make the wire speed identical which helps the machine to accelerate, decelerate, and avoid the paper sheet broken due to the wire speed gap between transmission points. The speed regulation accuracy of transmission system is required to be 0.1%. Normally the frequency accuracy of AC drive inverter should be 0.01Hz. The analog signal is exposed to electromagnetic interference which impacts the transmission precision and stability of paper machine. In order to enhance the accuracy and stability of system and anti-interference ability, the system takes PLC as the main drive unit, acceleration or deceleration at each step is controlled by button. The acceleration and deceleration of transmission points in the speed chain and the speed transmission rate are calculated and controlled by PLC that outputs speed regulation command to frequency inverter drive by RS485 communication in the way of data. 1. Open loop vector control variable frequency AC drives with high transmission accuracy, high dynamic performance, quick response, and etc. 2. System main control unit: Mitsubishi FX2N series PLC with 485 communication module and D/A module. 3. Each transmission point is in speed open loop control mode, and the speed control command is given by PLC. 1. Electric control system is in open loop control mode, simple structure, clear control logic relation, safe and reliable, easy operation. 2. Current vector control frequency inverter drives, flexible speed control, quick response and high dynamic performance. 3. The frequency accuracy is 0.01Hz. 4. Under PLC control, precisely calculating the transmission rate. 5. Thorough numeric communication control mode, strong interference resistance. 6. Automatically store the current speed during the operation. When stop and re-start with no need to regulate the speed.